“Pardon My Past” is an episode from Season Two of the TV series, ”CHARMED” (1998-2006). In it, one of the Charmed Ones – Phoebe Halliwell – is haunted by a spirit in her past life. The past life turned out to be one P. Russell, a first cousin of the sister’s great-grandmother. To find out why she is being haunted by P. Russell’s spirit, Phoebe visits 1924 and diiscovers that P. Russell was a pyrokinetic witch who had been romanced by a warlock named Anton. While in the past, Phoebe also acquired a glimpse into the past lives of her sisters – Prue and Piper. She discovers that they were former relatives of P. Russell and out to destroy her and all the latter’s future lives before any of them can become completely evil. Prue and Piper must then stop their past lives’ curse in the present before Phoebe falls victim to it and dies. This episode was the second, following Season 1’s ”That 70s Episode” that revealed their family’s past history. And like many of these episode . . . it had a lot of flaws. Let us take a look at them, shall we? *Ownership of the Manor – In this episode, it was revealed that the parents of the sisters’ grandmother – Penelope Johnson Halliwell – had been living in the manor in 1924. Yet, according to the Season 1 episode – ”Is There a Woogy in the House?” – the Halliwells (which happened to be Penny’s in-laws) had purchased the manor following the San Francisco Earthquake in 1906. How was this possible? According to the family tree, P. Russell lived during the period July 1894-February 17, 1924. She was 29 years old when her cousins killed her. The episode ”Pardon My Past” occurred between February 16-18, 1924; and February 16-18, 2000. Phoebe was born on November 2, 1975; making her 24 years old at the time, not 29 years old. If Leo had been at medical school at the time when the U.S. entered World War II, he should have at least older than 22 years old when he joined the Army. Which means that he should have already been alive at the time of P. Russell’s death in 1924. ”Phoebe: Not much time. By midnight, I’ll be dead again. Piper: By midnight? How do you know that? Leo: You go back to the past again and find some answers. How on earth did she come to this conclusion without knowing the facts? Or was this another example of the Halliwells producing theories out from their respective asses? What the hell? How did Leo come to this conclusion? Although Past Piper (P. Baxter)’s ability – slow down others – was a variation of Piper’s ability, Past Prue (P. Bowen)’s ability turned out to be cyrokinesis (freezing ability), which had nothing to do with Prue’s abilities of telekinesis or astral projection. Nor did P. Russell’s ability (pyrokinesis) have anything to do with Phoebe’s ability of precognition. And why is Phoebe’s precognition ability considered a REGRESSION of P. Russell’s fire ability? Phoebe is a seer. She has the ability to summon information on the past, the present and the future through visions. Information is power. Both of her parents have told Phoebe that many magic practitioners would kill to be a seer. Apparently, Phoebe never believed them. Even the Source did not want Phoebe’s precognition ability . . . despite the fact that he had depended upon two seers. Which only tells me that even intelligent individuals like Phoebe and the Source can be incredibly stupid. Despite what Leo had believed, witches ARE mortals. If Piper could die from a bullet wound in an alternate timeline, then witches are mortals. And if witches are mortals, then warlocks should also be mortals. Which means that either Anton should have aged or he was something other than a warlock. Also . . . the sisters and Leo have declared many times that evil cannot love. Yet, Anton was in love with P. Russell and had remained in love with her for a long time. Phoebe’s Warning in the Book of Shadows – Apparently, all of Phoebe’s future lives are doomed to die in their early 20’s unless they can somehow stop P. Bowen and P. Baxter’s curse from affecting them. They end up saving present Phoebe by putting the necklace on her, but the rest of her future lives are still doomed to die in their early 20’s. 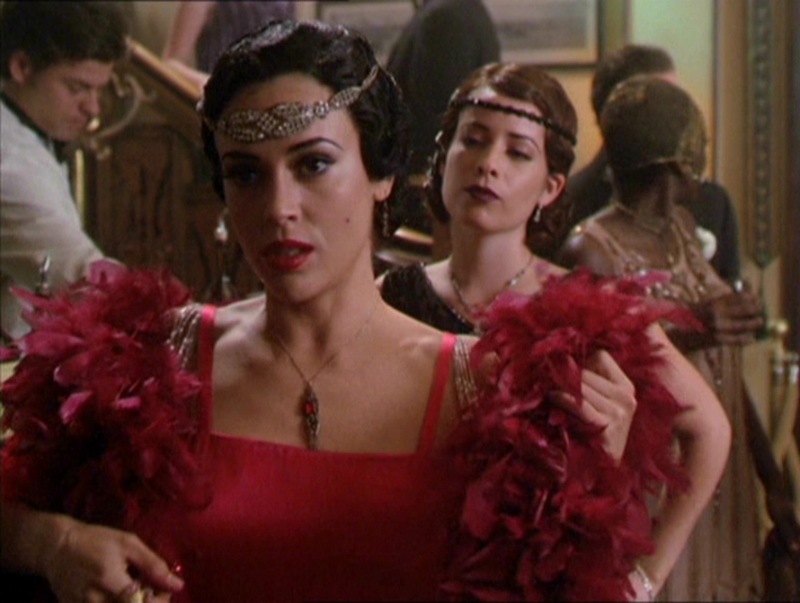 Thus, Phoebe wrote a warning in the Book of Shadows to warn her future selves about this. What if Phoebe’s future selves do not end up as a member of the Warren family line? Had anyone stopped to think of this? Gordon Johnson’s Piano Talent . . . or Lack Of – Greg Vaughn, as the Charmed Ones’ great-grandfather, Gordon Johnson, is shown playing the piano in 1924. Unfortunately, it appears that Vaughn lacked the talent to fake playing the piano. One can easily see that his fingers do not even reach the keys. -Grams’ age: According to the family tree, Penelope Johnson (the sisters’ grandmother) was born in 1937. She gave birth to her only daughter, Patricia Halliwell, in 1950. Are we expected to believe that Grams gave birth to Patty at the age of 13? I rather doubt it. The family tree also stated that Grams had died on March 3, 1968. Gee, they got the date of Grams’ death wrong by 30 years. -Piper’s birth year: According to the family tree, Piper was born in August 1973. Yet, in one S1 episode, Piper had identified herself as a Gemini. Also, in the S1 episode, ”Thank You For Not Morphing”, Victor clearly made it apparent that she was three years older than Phoebe, who was born in 1975. The S3 episode, ”Coyote Piper”supports Victor’s words with its revelation that Piper had graduated from Baker High in 1990, making her birth date of 1972 very plausible. And I doubt that young Piper was less than two years old in S1’s ”That 70s Episode”. -The name of the Charmed Ones’ grandfather: According to the family tree, the name of the sisters’ maternal grandfather happened to be Jack Halliwell. Yet in the S6 episode, ”Witchstock”, he is renamed Allen. All I can say is . . . what happened to Jack? I wish I could say that ”Pardon My Past”’s glimpse into the Warren family line was interesting. But it was filled with so many inconsistencies that I cannot help but harbor a little contempt for the writer who had penned this episode.